Do you suffer from an itchy, inflamed, irritating skin condition? Have you tried endless topical creams with little to no success? Have you been told your condition can not be cured? The skin plays an extremely important role in the body as a protective layer from bacteria, as a body temperature regulator, a sensory organ and an organ of elimination. Unfortunately, many people will suffer from a skin condition at some point in their life, whether in a mild form or much worse. Eczema, psoriasis, dermatitis, seborrheic dermatitis, rosacea and acne are just some of these conditions that can range from irritating to severely debilitating and distressing to the individual. They may impact so much on the person’s life that they create further health issues such as social isolation, anxiety and depression. Put simply, these conditions are signs that your body is inflamed. So rather than applying chemically-potent creams & lotions on the skin, we need to identify what is wrong or out of balance inside your body and resolve that. One of the main causes of eczema and dermatitis is a disturbed or poorly functioning immune system. So what is it that can upset our immune function? Leaky gut or increased intestinal permeability: Leaky gut creates low-grade inflammation as a reaction to undigested particles leaking through unhealthy gut walls. This results in food sensitivities, in particular gluten and dairy, but can also trigger other health problems. Fatigue, headaches, allergies, irritable bowel (IBS), poor concentration, acne, depression, sinus issues, joint pain, reflux and autoimmune diseases are all commonly linked with leaky gut. Abnormal gut flora (microbiome): Gut dysbiosis or an overgrowth of bacteria or yeast will impact on good gut bugs and throw them out of balance. This is a common cause of eczema and dermatitis and can be eliminated by avoiding a high sugar, refined carb diet. It is also triggered by the over-use of antibiotics, steroids, HRT and birth control pills. Let’s not forget that chemicals in skin care, make-up, detergents and cleaning products can also trigger eczema and dermatitis. Since over 2/3rds of our immune system is located in the gut, many other culprits can affect the health of the gut. A number of small changes along the intestinal tract from multiple insults will over time compromise the healthiest immune system. For example, too many antibiotics, aspirin, reflux drugs, stress, food sensitivities, infections and toxins will alter our ability to protect our body with a healthy immune response. Conventional drugs just mask the symptoms and can make the body more toxic. Dietary and lifestyle improvements offered by a Naturopath can address the causes. ‘Food is medicine’ as Hippocrates stated many years ago. The wrong food choices can make us sick. Sustaining and nourishing fresh food nurtures and heals, and can prevent and even cure disease. So what is inflaming the gut? Processed, refined carbohydrates, sugar, flour, additives, preservatives, MSG, artificial sweeteners and trans-fats all act like poison in the gut and inflame the gut and cells, making them sick. We experience the sickness as pain, headaches, allergies, depression and fatigue and these inflammatory states can lead to increased gut dysfunction, weight gain, diabetes and heart disease. The right balanced diet will reduce inflammation, settle, rebalance and heal the gut, and provide the immune system with the boost it needs to perform well again. Eczema and dermatitis can be healed. Psoriasis can be a thoroughly debilitating condition. The conventional medical approach today is to offer alpha blockers and steroids (among other medications and topical creams) which are known to suppress the immune system, trigger infections and can cause cancer. There is no need for such invasive action. We have the answers to poor skin health – “Food is Medicine.” With the right foods and nutrients, the body can be nourished and heal itself. By embarking on a whole food, anti-inflammatory diet and removing food allergens the first steps to healing can occur. Leaky gut caused by a yeast overgrowth can be remedied and gut health restored. Regular exercise acts as a natural anti-inflammatory, so daily movement is recommended. An added bonus is the feel-good endorphin kick that we get from exercise, so our mood is elevated as well. Testing may be required for heavy metals to rule out their influence. In some instances a well-designed, personalised detox may be necessary which incorporates an elimination diet for a period of time while healing occurs. Skin conditions can be worsened by high levels of stress, so an important part of recovery is to practice relaxation on a daily basis. Calming techniques such as yoga, deep breathing, meditation and massage can reduce stress and promote relaxation. Also, don’t underestimate the power of a great night’s sleep. Interrupted sleep is one of the biggest issues impacting our health today. Sleep quality can be improved with some easy tips and suggestions. Strangely, acne used to be seen as a teenage-hormonal affliction, but it is increasingly being found among our adult population as well. Why is this happening? 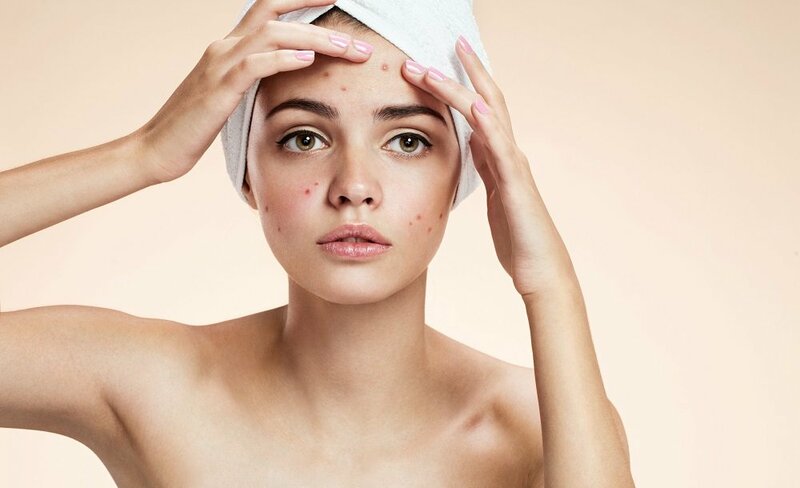 Again, the factors that are likely to contribute to acne include stress, toxicity, inflammation, nutritional deficiencies, and hormonal and gut imbalances. One of the biggest culprits that results in inflammation is a processed, sugary diet. Along with a high intake of dairy, sugar and processed refined carbohydrates can exacerbate acne. Sugar (including flour): Sugar raises insulin levels. Insulin is a necessary hormone needed to clear sugar from the blood. But when we over-eat sugar and refined carbs, we over-produce insulin constantly. Since insulin is a great fat-storing hormone our body will get the message that fat needs to be stored. So excessive consumption of sugar or refined carbs will lead to weight gain. Too much bread, pasta, cereal, sugar and flour products like pastries, will cause this insulin reaction and can lead to the formation of acne. Dairy: Ever wondered how farmers are able to increase their cows milk production? Growth hormones are added to their feed. When humans ingest the milk they get a hit of the hormone as well. Trials have proven that this can cause or increase the severity of acne. Chronically elevated insulin can cause hair growth on the face and body and loss of hair on the head in women. Many women also suffer irregular menstrual cycles and acne, while for some women PCOS (Polycystic Ovarian Syndrome) may manifest. The short answer is that you need to get your insulin levels under control to get acne under control. This condition mainly affects the scalp and results in itchiness, scaly patches, inflammation and dandruff. Naturopathic treatment of this skin condition follows a similar plan to the eczema treatment since the causes also stem from gut issues in the main, but may also may include treatment for fungal overgrowth. Avoid excessive dietary intake of saturated fats: Refined and processed foods, hydrogenated vegetable oils and red meat should be eliminated until skin has recovered. Small portions of some saturated fats are good for heart health, so should not be entirely avoided, eg. coconut products. Remove sugars and refined, processed carbs from the diet as these feed the fungus. Food allergens are known to trigger or worsen this condition. Avoid common allergens like caffeine, wheat and dairy, citrus fruits, corn products and peanuts. Basically, an anti-inflammatory diet goes a long way to resolving this and other skin issues, with attention to rebalancing gut health.